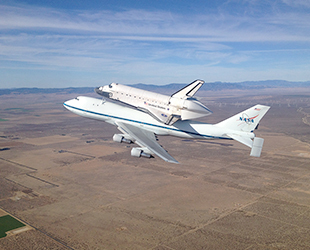 September 21, 2012 – The last-ever space shuttle to take flight has made its final landing. 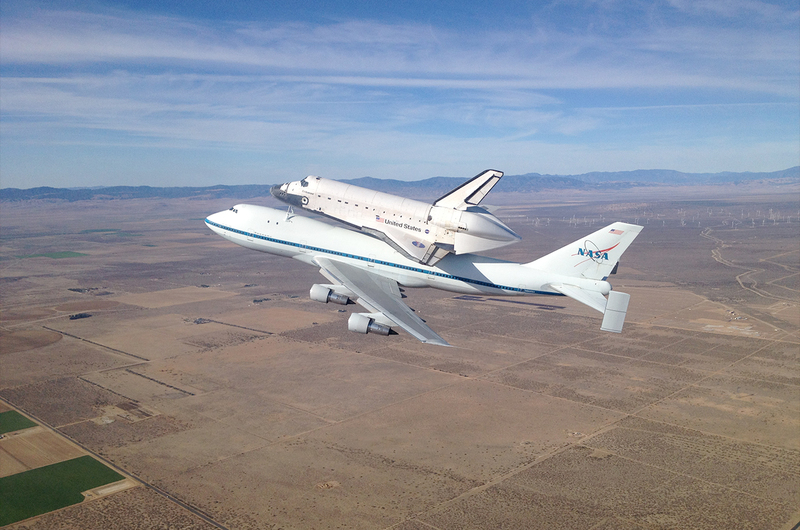 Space shuttle Endeavour, mounted atop NASA's Shuttle Carrier Aircraft (SCA), a modified Boeing 747 jumbo jet, touched down at Los Angeles International Airport (LAX) in California Friday (Sept. 21) after a three day, cross-country trip from Florida. The iconic black and white spacecraft, riding piggyback on the blue and white NASA aircraft, landed on the southern most runway at LAX at 12:51 p.m. PDT (3:51 p.m. EDT; 1951 GMT). The early afternoon arrival marked the end of not only Endeavour's airborne journey, but the final ferry flight of the space shuttle program era. 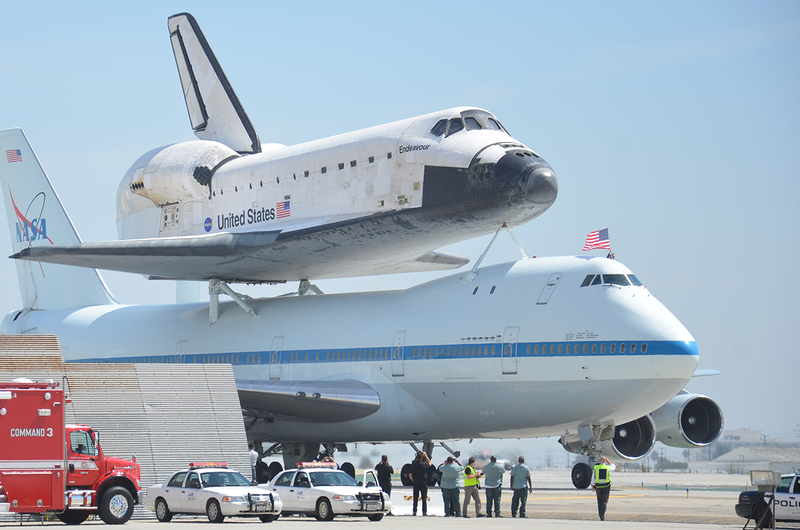 The CSC held a welcome ceremony for the arriving shuttle and SCA at the United Airlines' hangar where Endeavour will be hoisted off the aircraft and readied for its city street transport. State and local officials heralded the arrival as a homecoming — Endeavour and its sister ships were built and assembled in southern California. Taking off at 8:17 a.m. PDT (11:17 a.m. EDT; 1517 GMT), the carrier aircraft flew Endeavour over its birthplace, the city of Palmdale where it was assembled, as well as the surrounding towns of Lancaster, Rosamond and Mojave, before heading north to Sacramento for a flyover salute of the state capital. The flight was delayed getting started by an hour to allow the fog to rise by the time the air- and spacecraft reached San Francisco Bay for a scenic overflight of the Golden Gate bridge. The SCA and shuttle then flew a low pass by NASA's Ames Research Center and, further south, the Jet Propulsion Laboratory (JPL). 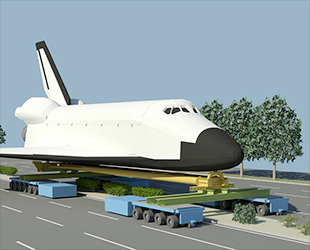 Beginning Oct. 12, Endeavour will exit the airport on top of the modified NASA transporter using four self-propelled, computer-controlled vehicles. 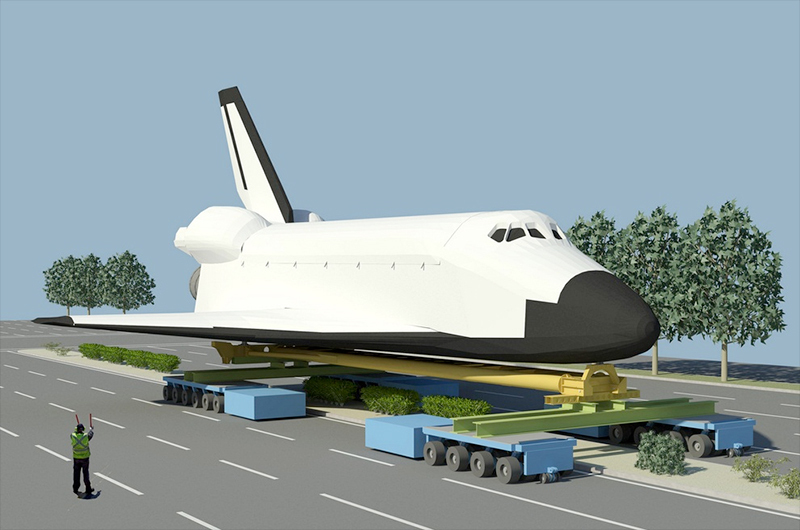 The 12-mile (19 km) trip will take the shuttle through the streets of Inglewood and Los Angeles, where again thousands of residents and visitors are expected to get an up-close view of the orbiter on the move. 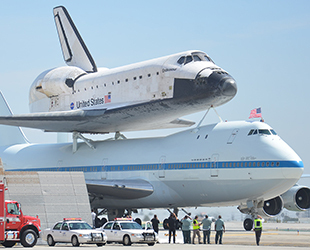 To facilitate the street parade, the CSC has been working to temporarily remove or raise traffic lights, power lines and other obstacles to the shuttle Endeavour's 78 foot (24 meter) wingspan and 58 foot tall (18 meter) tail. The center has also had to have removed nearly 400 trees in the way, but are investing $500,000 to replace each with as many as four in their place, a well as provide two years of tree maintenance. Reaching the CSC by dusk on Oct. 13, Endeavour will be towed the final quarter of a mile (400 meters) by a Toyota Tundra pickup truck as part of a partnership and promotion that could raise upwards of $500,000 towards the shuttle's final exhibit. The Oschin pavilion is a temporary home for Endeavour; by 2017, the CSC plans to open the Samuel Oschin Air and Space Center to present the space shuttle vertically, as it was on its launch pad. The California Science Center's Endeavour exhibit is one of only four displaying the retired shuttles. Discovery, the fleet leader, is now at the Smithsonian in northern Virginia. The prototype Enterprise is in New York City on board the converted aircraft carrier at the Intrepid Sea, Air & Space Museum. Atlantis, the last shuttle to fly into space during NASA's 135th mission, will be moved to NASA's Kennedy Space Center Visitor Complex in November.